UPDATED: Mon., April 3, 2017, 11:53 p.m.
GLENDALE, Ariz. – Nigel Williams-Goss came to the interview room with red eyes. He made it through one question before choking up. Gonzaga and Williams-Goss aren’t used to losing, and coming up short in a winnable game on college basketball’s biggest stage brought raw emotion to the surface. North Carolina scored the final eight points to overtake the Zags, claiming the Tar Heels’ sixth national championship with 71-65 victory in front of 76,168 Monday at University of Phoenix Stadium. The Zags (37-2) were right in position with 1:50 remaining after a Williams-Goss bank shot put them on top 65-63. The junior guard scored Gonzaga’s last eight points. But the Tar Heels (33-7), frigid from the field most of the night, made three of their last four attempts, and they retained possession after the lone miss. Williams-Goss sprained his ankle with 1:25 left, the same one he tweaked in the South Carolina game. He missed his last two shots. Gonzaga’s defense, which carried the Zags all season, was outstanding again. North Carolina’s was even better. The Zags shot a season-low 33.9 percent, struggling to deal with the Tar Heels’ size, athleticism and length. North Carolina wasn’t much better from the field but reached 35.6 percent with its late-game success. It was the first time all season an opponent shot a higher percentage than Gonzaga. “They disrupted us, climbed up into us, and kind of drove our offense outside the normal area as far as our wing touches and our entries,” Few said. “Their bigs … they’re a mirror of us. Williams-Goss finished with 15 points, nine rebounds and six assists. Gonzaga’s Przemek Karnowski, Johnathan Williams and Zach Collins spent most of the second half in foul trouble. The three combined for 27 points. Tournament most outstanding player Joel Berry II, bouncing back from a subpar first five tournament games, made four 3-pointers and scored 22 points. Justin Jackson added 16 points, despite missing all nine of his 3-point attempts. Gonzaga was outscored 40-18 in paint points and 20-14 in second-chance points. The Tar Heels also converted Gonzaga’s 14 turnovers into a 15-7 edge in points off turnovers. Gonzaga had the upper hand most of the first half, thanks to Josh Perkins’ 13 points, but the scoreboard didn’t reflect it. The Zags led for 15 minutes and twice stretched the margin to seven. Each time, the Tar Heels came back, helped by their work on the offensive glass. 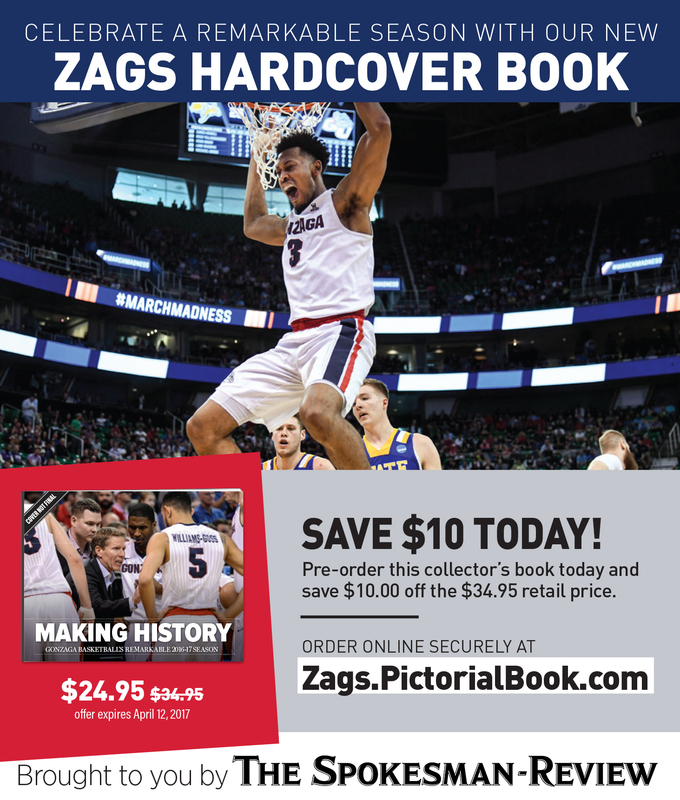 Williams’ jump hook put Gonzaga up 21-14 with 10:10 left, but Berry connected on a 3-pointer while being fouled. He missed the free throw but Jackson made a putback 30 seconds later and the Zags’ lead was down to two. Gonzaga pulled out to a 28-21 advantage on the last of Perkins’ three first-half 3-pointers and another Williams’ basket. North Carolina scored seven of the next nine points, including three free throws when Berry was fouled again on a 3-pointer. GU settled for a 35-32 lead despite outshooting the Tar Heels by nearly 10 percentage points. Published: April 3, 2017, 8:52 p.m. Updated: April 3, 2017, 11:53 p.m.